Our healthy pancakes are perfect for you robots avoiding gluten or watching your caloric intake. As always, they are easy as pie to make – actually, probably easier, ‘cause let’s face it, the only easy thing about pie is eating it! 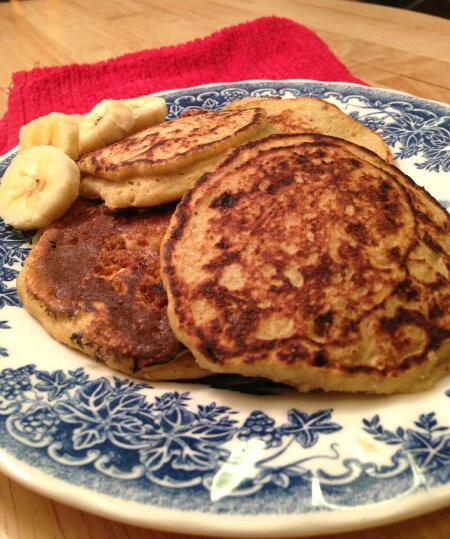 These 3 ingredient pancakes are also perfect for you robots with morning hangovers as they’re low maintenance and the bananas replenish the potassium lost to alcohol’s diuretic effect after a night of heavy drinking. Seriously, do you need any more reasons to try these pancakes now? In a medium-sized bowl, beat the egg with a fork or whisker. Next combine the mashed banana with the egg. Gradually add the oat flour to the mixture while stirring continually until a thick batter forms. Let the batter sit for a minute or two. While you’re waiting, spray a frying pan with non-stick cooking spray place it over low heat. Add two heaping tablespoons of batter to the pan for each pancake. Heat each pancake for 45-seconds to one minute and then flip. Be careful not to overcook them. No matter how impatient or hungry you are, keep the heat on low and cook each pancake separately.